MIUI is one of the most popular custom ROM and packed with some awesome features. The ROM looks completely different from all the other ROMs and has some awesome skins. 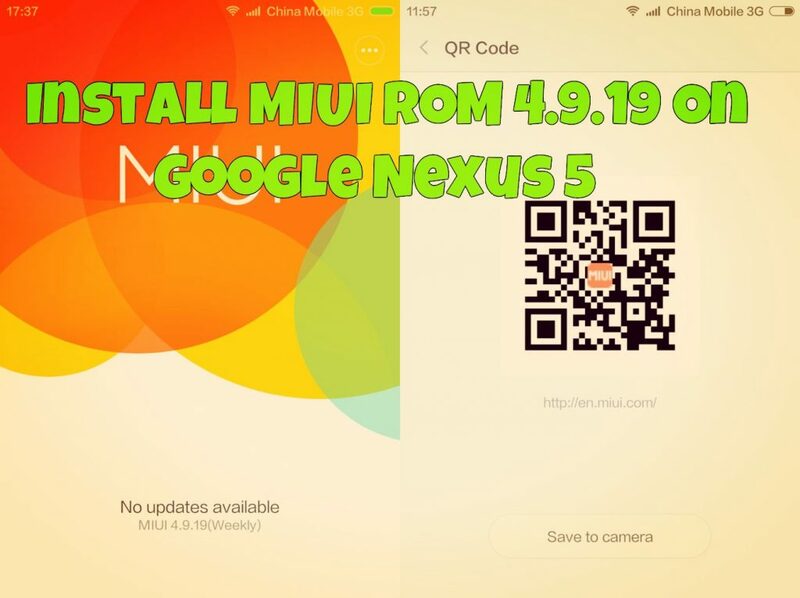 Recently the MIUI team released the new MIUI ROM 4.9.19 for Samsung Galaxy S4 I9500, Samsung Galaxy Note 3, Google Nexus 5 and OnePlus. The new rom comes with lots of new features, browser, new explorer, Brand new UI design? and new icons. If you are the Google nexus 5 user and want to try the new rom in your phone, here is the complete guide which you can follow on your phone and test the new ROM. The process is very simple and takes a few minutes to flash the ROM file. To get started all you need a rooted nexus 5 with unlock bootloader and custom recovery. After this do take the full backup of your phone and save the backup file in some place. Step 3. Enter Recovery. To do this press and hold Volume Down, Volume UP and Power buttons all at the same time. Release the buttons only when the Fastboot / Bootloader Mode options appear. Now a START text is listed at the upper part of your device’s screen, use the Volume buttons to change START to Recovery Mode option. Press the Power button to select Recovery Mode. Step 7. Select [install zip from sdcard0] for internal memory and install the zip file. Step 8. Wait until flashing will finish then reboot phone. Step 9. After that reboot your system. Voila! Now your nexus 5 is running on the MIUI ROM 4.9.19. To download the Google apps on your nexus 5 read our guide here.